On Thursday 6 December, the city of Amsterdam is organizing a symposium on post-war monumental wall art. In the past two years, Amsterdam's monumental wall art from the Reconstruction Period (1945-1975) has been inventoried and assessed at the request of the City Council. In this symposium, a number of speakers, a.o. 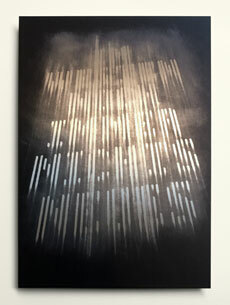 Martijn Sandberg, will discuss post-war wall art from different angles. A selection of recent works by Martijn Sandberg can be found here in the website section 'prints & editions'. It includes 'Im Westen Noch Immer Nichts Neues', 'Temporary Contemporary', 'Nothing New Under The Sun', from 'Hallucinations' (2017-2018); an ongoing series of works on brushed aluminium. Each, ink on aluminium, 21cmx30cm. Martijn Sandberg has been invited to develop a plan for a site-specific artwork to be realised at the location Werkspoorhal, Oostenburg, Amsterdam. 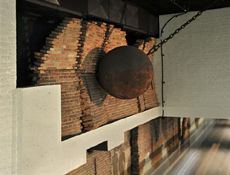 The artwork by Martijn Sandberg will be an integral part of the pipe system in the interior of the former industrial complex Werkspoorhal. Redevelopment project by: Vorm Ontwikkeling BV, OZ Architectenbureau, Amsterdam, Workshop architecten, Beta Architecten, Space Encounters, Lola Landscape Architects. Van Iwaarden Artwork organizes an exhibition in their establishment in Amsterdam on the 25th and the 26th of November 2017. In the exhibition Van Iwaarden shows art projects they technically developed and accomplished for different artists. Besides this, original works will be on view of all participating artists. With Aam Solleveld, Anuli Croon, Jan van der Ploeg, Martijn Sandberg, Nicole Martens, Roland Schimmel, Sanne Bruggink, Tim Ayres and Walter van Broekhuizen. Van Iwaarden assisted in the technical realisation of the following public artworks by Martijn Sandberg: 'Silence Please Science Please' (2017), 'U Heeft Tien Bewaarde Berichten' (2013), 'De Sleutel Ligt Onder De Deurmat' (2012), 'Forever Young' (2005). Martijn Sandberg's plan for a site-specific artwork has been selected by the jury to be realised at the location KVL, Oisterwijk, The Netherlands. The artwork will be an integral part of the redeveloped industrial complex of the former Royal United Leather Factory, Leerfabriek KVL. Realisation of the artwork by Martijn Sandberg is expected to be completed in 2019. Art jury committee: BPD Ontwikkeling BV/BPD Kunstcollectie, Diederendirrix Architecten, MTD Landschapsarchitecten, Sundaymorning@ekwc/Europees Keramisch Werkcentrum EKWC, Municipality Oisterwijk. 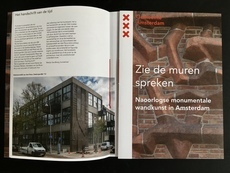 The building project FIRST by De Architeken Cie. at Weena Rotterdam, with the brick artwork 'One More Wall Well Done' by Martijn Sandberg, is featured in the NAi yearbook edition 'Architectuur in Nederland 2016/2017' ('Architecture in The Netherlands 2016/2017'). Click here for photos and information on the artwork 'One More Wall Well Done' by Martijn Sandberg, in the section 'public artworks'. Click here for PDF of article "Archetype van een muurtje" ("Archetype of a wall"), kM Magazine, kM 101 (2017), text NL. Click here for text NL-ENG, in the section 'articles'. Based on the French documentary, a book has been released in the Netherlands, titled 'Safari Typo Amsterdam'. 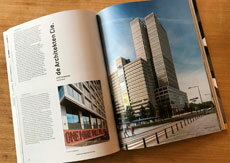 The booklet is a brief typographic tour of letters in public space in Amsterdam, presented by type designer Bas Jacobs. Featuring a.o. the brick letters from the artwork 'Forever in Stone' by Martijn Sandberg, and letter forms by Piet Kramer, Reinoud Oudshoorn, Anton Kurvers, Janno Hahn, Hijman Louis de Jong, Rene Knip. 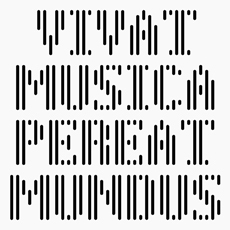 More about the publication: 'Safari Typo Amsterdam', ISBN 978 94 90913 66 3. More info on the artwork: 'Forever in Stone', section 'public artworks'. 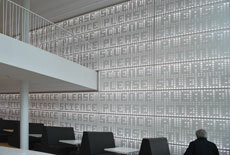 Martijn Sandberg has realised a site-specific artwork: an acoustic wall in the interior of the newly constructed Gorlaeus Beta Campus of the Faculty of Mathematics and Natural Sciences (FWN), University of Leiden. 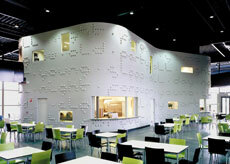 The artwork consists of connected perforated aluminium panels, covering the surface of the wall in the hall, vacant space and first floor of the building. 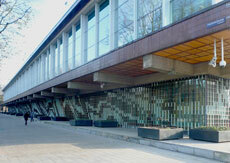 The perforated artwork is twenty metres long, seven metres high and lit from within. A sequence of words appears in the pattern of circles when the artwork is viewed from different sightlines. The words may be read in succession from left to right - but also from right to left, from above to below, from below to above and in diagonal reading order: 'Silence Please Science Please'. Click here for more photos and information on the artwork 'Silence Please Science Please', in the section 'public artworks'. The team of Korth Tielens Architecten and Marcel Lok Architect with project developer Heijmans Vastgoed, DS landschapsarchitecten, artist Martijn Sandberg and Fore installation consultants, has been selected to further develop their plan for the housing programme to be realised at the former Spaarndammer School site, Amsterdam. The Spaarndammer School site (Spaarndammerschoollocatie) is located in the Spaarndammerbuurt, an area of the city with listed residential housing, characteristic of Amsterdamse School architecture. Click here for more info, article (in Dutch), 'Uitslag tender Spaarndammerschool', www.dearchitect.nl, news, 02/12/2016. Click here to view or download more info on the artwork, concept text (in Dutch), 'Kunsttoepassing Spaarndammerschoollocatie', as pdf. Click here for more images and a selection of concept drawings of the artwork, in the section 'concepts & projects'. Martijn Sandberg has realised a site-specific artwork on the Southern facade of First, a new build project on the Weena in Rotterdam, The Netherlands. 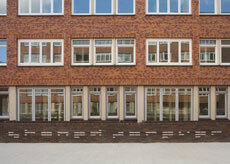 The brick facade relief covers a wall surface measuring three and half metres high and twenty seven metres long. A message has been left on the wall, written in relief with brick letters two and half metres high: 'One more wall well done'. 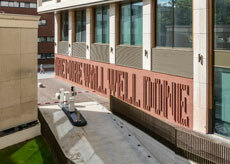 Click here for more information on the artwork 'One More Wall Well Done', in the section 'public artworks'. 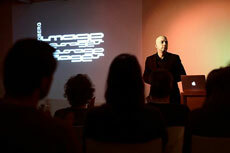 Martijn Sandberg speaks about his artworks in public space and architecture at BNO, Utrecht, on Tuesday evening 25 March 2016. Other lectures by Floor Wesseling and editors of magazine De Dakhaas. Martijn Sandberg reacts to the call for the De Nederlandsche Bank to be demolished to enable the return of the Palace for National Industry (Paleis voor Volksvlijt) to the Frederiksplein in Amsterdam. 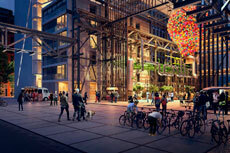 Demolition of De Nederlandsche Bank, however, would imply that Peter Struycken's intriguing artwork would be permanently lost to the Amsterdam street scene. The text 'Instead Of 'DNB Must Not Be' may be found in Dutch and English on the website in the 'blog' section. The Zuiderkerk Prize 2013 has been awarded to the housing and renovation project Kraaipanschool in the Transvaal neighbourhood in Amsterdam. 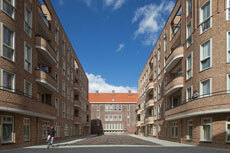 The design is by Architectenbureau Hoogeveen, commissioned by housing association Ymere. The paving artwork 'Tomorrow Everything Will Be Alright' by Martijn Sandberg is located on the new square of the Kraaipan project. 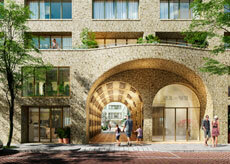 The Zuiderkerkprijs is an annual award by Amsterdam city council for the architect and the commissioning client of the best housing project realised in the city of Amsterdam during the past year. 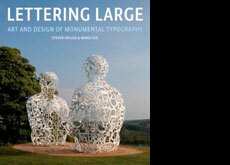 Works by Martijn Sandberg are featured in the recent book edition 'Lettering Large: The Art and Design of Monumental Typography', published by The Monacelli Press, New York/ USA. The selected works include the public artworks 'The Key Is Under the Doormat' (2012), 'You Have Ten Saved Messages' (2013), and 'Forever Young' (2005). Martijn Sandberg reacts to the threatened disappearance of distinctive works of art created in the Seventies and early Eighties from several stations involved in the Amsterdam Metro East Line renovation. A short version of the text 'Demolition Ball and Battle of Waterloo' by Martijn Sandberg can be found in English and Dutch at the website's 'blog' section.